On their own, I’m not a big fan of anchovy fillets. But when they’re mixed into a sauce it’s a different matter. The creamy dressing which goes with Caesar Salad contains anchovies and it just wouldn’t be the same without them. Salmon is on the menu about once a week in our house. It’s so quick and easy – dinner can be on the table in under 15 minutes. 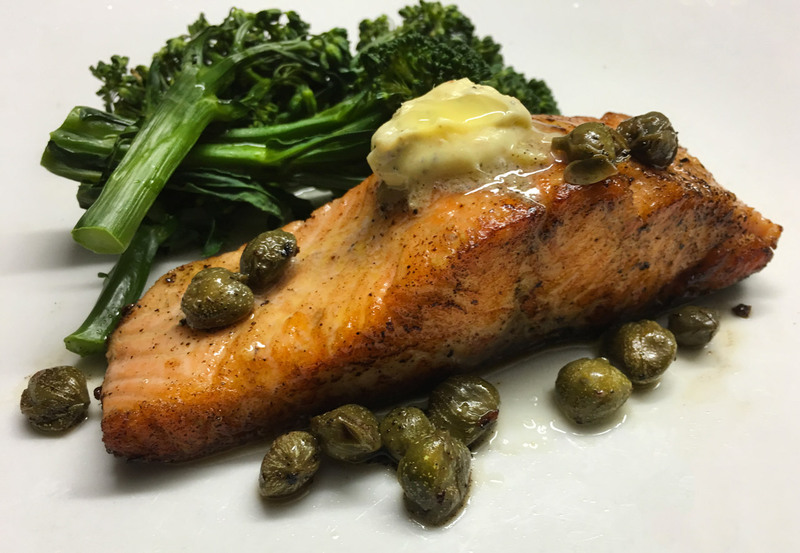 So when I saw this recipe for Salmon with Anchovy Garlic Butter I thought I would give it a try and we weren’t disappointed. 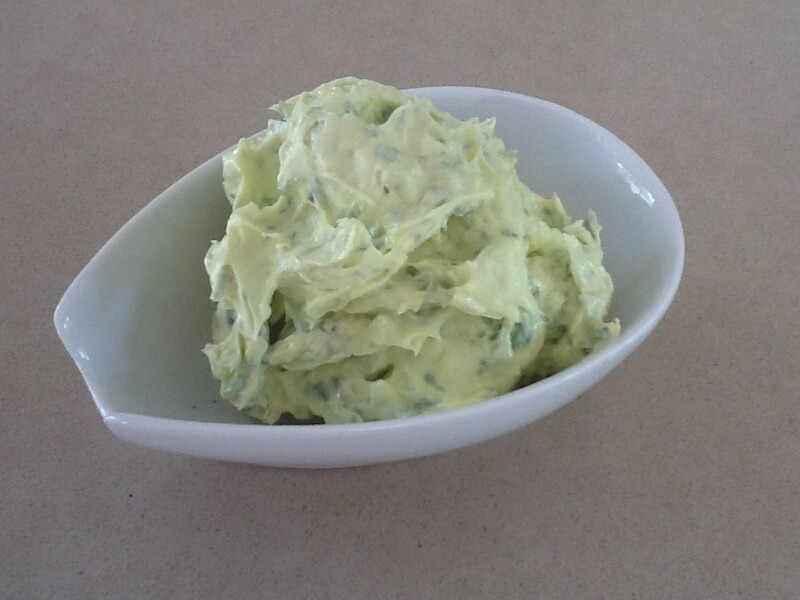 In a small bowl place all ingredients for the Anchovy Garlic Butter and mash together thoroughly with a fork. Place about half in a small non-stick frying pan and when hot add the salmon fillets, skin side down and cook for 2-3 mins or until the skin is crisp, then turn and cook for 1-2 minutes on each of the other three sides. This will result in salmon which is still a bit pink in the middle. If you like it more well done just increase the cooking time. Towards the end of the cooking add the capers to the pan, so they warm up. Meanwhile steam broccolini until done then arrange with salmon on serving plates. Put a small amount of the remaining Anchovy Garlic Butter onto each salmon fillet, put the rest into the pan and mix with the pan juices, then spoon over the salmon and broccolini. Squeeze over the lemon juice and sprinkle the salmon with parsley. 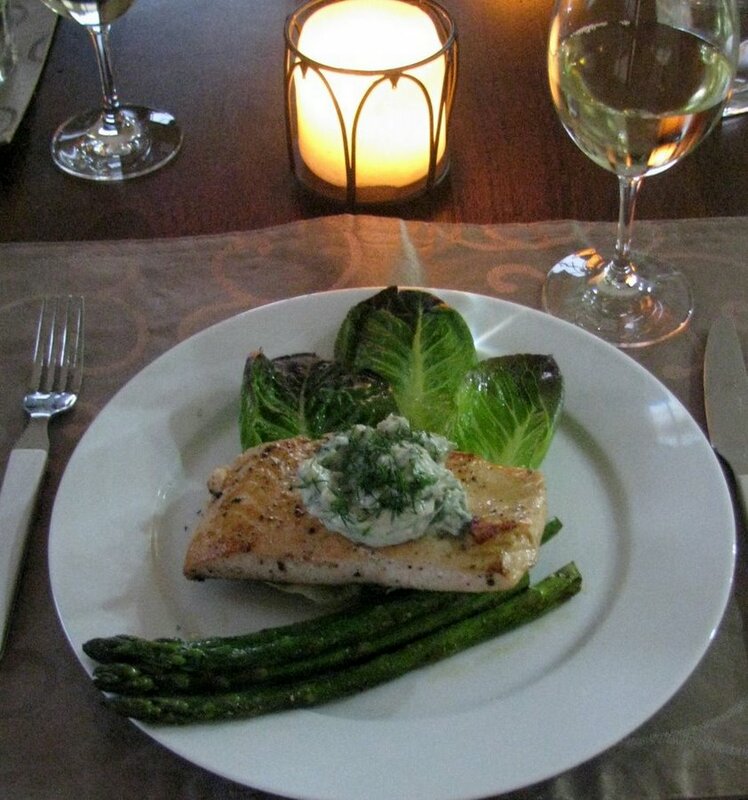 This entry was posted in Recipes and tagged easy, quick, salmon, summer by Linda Peek. Bookmark the permalink.